DEMO is a concept for an electricity-producing, tritium-generating, long-pulse tokamak one step removed from an actual industrial and commercial fusion power plant. The ITER Members all have a different notion of what their DEMO could be. 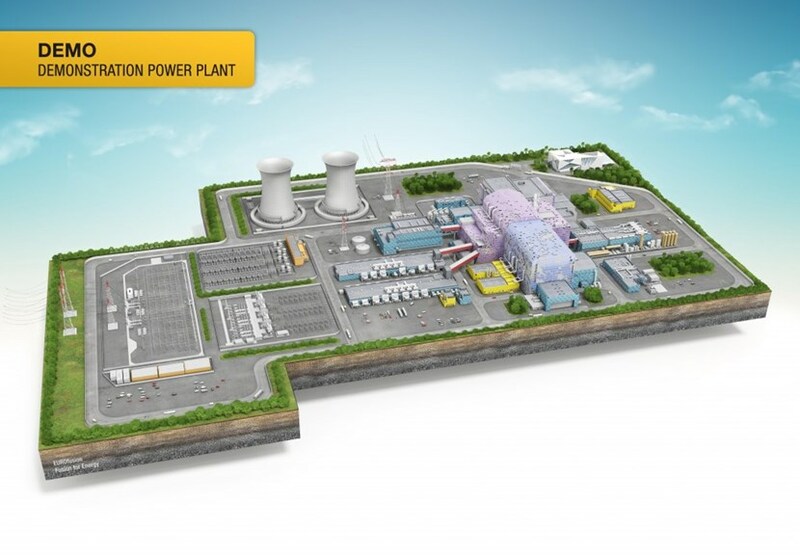 A central requirement for the European DEMO, as defined by the EUROfusion roadmap, would be to produce several hundred megawatts of net electricity to the grid (300 to 500 MW), which is approximately ten 3-4 times less than an average nuclear fission reactor. Europe's DEMO would be a "demonstration power plant" to be followed by the first-of-a-kind fusion power plant. And with careful observation, that is what we are seeing in this illustration, recently produced by EUROfusion and the European Domestic Agency for ITER, Fusion for Energy. Although larger than ITER, DEMO is organized along the same logic—central Tokamak and Assembly buildings, large electrical switchyard, magnet power conversion buildings, cryoplant with helium storage tanks, and heat removal through large cooling towers. The main departure from the ITER layout is the large blue building in the centre of the illustration. This building is where the thermal power generated by the DEMO tokamak will be converted to electrical power by way of turbines and alternators—just like in any electricity-producing plant, whether from coal, gas, fuel or nuclear fission. One other important difference between ITER and DEMO is hidden from view—the breeding system inside the DEMO vacuum vessel that ensures the continuous production of tritium to fuel the fusion reaction, a condition sine qua non for the future of fusion energy.